Above: A packed crowd at UNM’s boisterous Pit cheers the Lobos against the San Diego State Aztecs on Senior Night, March 4, 2017. The basketball capital of the world is not the Garden in New York or the streets of Harlem. It’s not the playgrounds of Indiana, either. . . . Los Angeles, home of the Lakers and UCLA, is a pretender to the title. Kentuckians, North Carolinians, and Marylanders think only they like the sport. Nope. 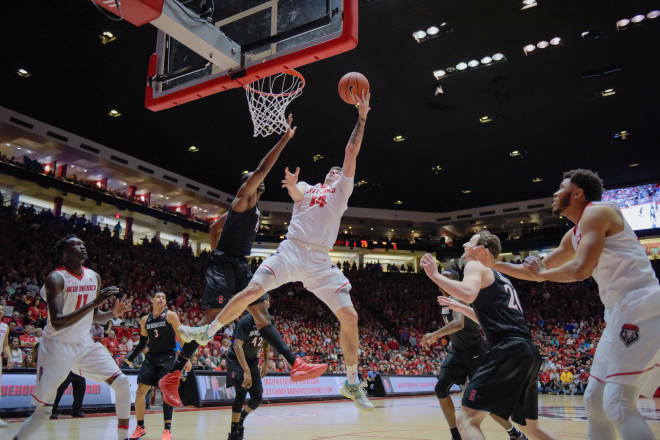 New Mexico is the basketball capital of the world. From Wagon Mound to Wingate, from Aztec to Animas, from the ponderosa high country to the Chihuahuan Desert, they go bonkers over the game in the Land of Enchantment. Sure, basketball should be a game for population centers of the East. It’s a game for a confined area, for the concrete canyons of the megalopolis, not the wide-open spaces of the Southwest, where kids should be drinking up fresh air as they backpack, ski, or test a dry fly on the Río Chama. You’d think the number-one sport in New Mexico would be rodeo. Or horseshoe pitching. Cow chip tossing. Chile eating. But logic has little to do with it. Basketball mania reigns across the length and breadth of the 47th state.